The exhibition HANDMADE–Expo – the expected event in the sphere of art&hobby in Ukraine took place in Kyiv on September 26 – 29, 2018. The exhibitors and visitors have noted that the organizers of the HANDMADE-Expo successfully implement the most important tasks for the promotion of needlework and creative hobbies. After all, the HANDMADE-Expo exhibition is the only powerful b2b platform in the field of art&hobby in Ukraine, a meeting place for an inspired and inspiring community, as well as a cognitive and educational platform. 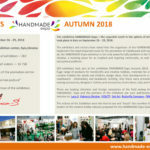 263 exhibitors took part at the exhibition HANDMADE-Expo Autumn 2018, they represented a huge range of products for handicrafts and creative hobbies, materials for artists, new ideas for creative hobbies for adults and children, design ideas, their developments in traditional types of needlework – embroidery and beadwork, knitting. Also there were presented fabrics, threads, sewing accessories, designers’ clothes and accessories, home decor, toys and handmade dolls.